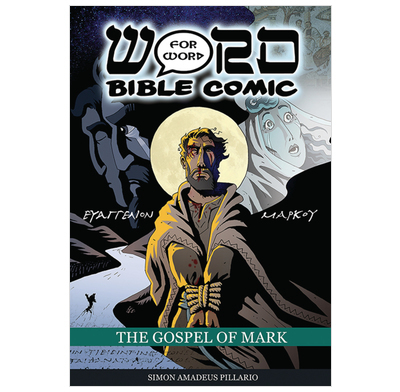 The Gospel of Mark is a 180 page graphic novel from the series: The Word for Word Bible Comic. The comic presents every word of the new testament scripture, within its historical, cultural and geographical context. It employs a high view of scripture and is aimed at adults and readers aged 12+. The Story Intro: After a brief time of liberty under the Hasmoneans, the people of Israel are once again under the boot of a foreign superpower. The Romans rule and tax every part of their world: water-tax, city-tax, road-tax, house-tax, even a tax on necessities like meat and salt. These fees were often 'harvested' by their own Jewish brothers, who would pay the oppressors and then skim off a little or a lot for themselves. For centuries, the Israelites have clung to the promise of a Messiah, one who would change everything. But this saviour is not what they’d thought he would be. This is a fantastic and unique book. No other comics I have seen have the whole of the book, unabridged. It’s great to know you are getting the whole story, not just the ‘highlights’ or the palateable bits. I’d always thought of comics as taking historical liberties or watering the story down but you can tell painstaking lengths have been taken to make the geography and culture come alive, making this more like an interactive and engaging study bible. I’d highly recommend this to both adults and teenagers and may well be the perfect thing to engage people in the living word who have previously struggled. I love the Word for Word Bible Comics and this latest edition is one of the best yet. The author has put in so much historical detail that it really brings the Gospel alive and you get a real sense of what life was like in the first century. Even better, it doesn't cut anything out - the entire biblical text is included. These comics are ideal for giving away to those who might struggle to pick up a bible. They're also a great study aid as it's like having a visual commentary. Highly recommended! This series is amazing! The images are so detailed and really help me to understand what it would have been like. I love that I can totally trust it to be a true bible translation too so I can use it for daily readings and understanding scripture. Highly recommended, even if you're not usually a comic book person! I have really appreciated this rendition of Mark's Gospel. It is great to know that as you read through, you are reading every work of Mark. No additions, no omissions. The pictures are great, with historical accuracy from the occasional disciple taking written notes on a tablet (not an ipad!) to the scenery and dress. I particularly appreciated how (for instance) extra pictures were put in between the call of Levi and going to his house. No extra words, just pictures as clearly Jesus had to walk there! Also love the temptation summary (again with no added words, just pictures of the things Jesus was tested with) and the different colourings of Jesus' stories, parables and historical throwbacks (John the Baptist's death). Excellent book, great visuals, and you read the whole Gospel - I really enjoyed it and continue to refer to it.